Mangrove forests thrive near the mouths of large rivers where river deltas provide lots of sediment (sand and mud). Mangrove roots collect sediments and slow the water's flow, helping to protect the coastline and preventing erosion. Over time, the roots can collect enough debris and mud to extend the edge of the coastline further out. Mangrove forests are teeming with life. Shorebirds, crab-eating monkeys, and fishing cats all make the mangrove home. Mangroves provide a safe haven and a nursery for a variety of fish, birds, crustaceans, and shellfish. A mangrove is a tropical maritime tree or shrub of the genus Rhizophora. 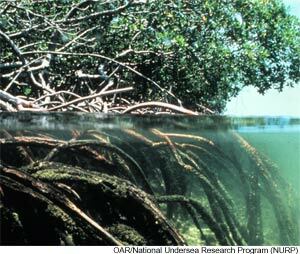 Mangroves have special aerial roots and salt-filtering tap roots that enable them to thrive in brackish water (brackish water is salty, but not as salty as sea water). There are several species of mangrove trees found all over the world. Some prefer more salinity, while others like to be very close to a large fresh water source (such as a river). Some prefer areas that are sheltered from waves. Some species have their roots covered with sea water every day during high tide. Others are more sensitive to salinity, and grow closer to the shore. Other species grow on dry land, but are still part of the ecosystem. 1. Support roots which directly pierce the soil. 2. Level-growing roots which twist upward and downwards, with the upward twists emerging on the water surface. 3. Level-growing roots whose downward twists (sub-roots) appear on the water surface. Any part of a root that appears above the water line channels oxygen to the plant below the water line. Over time as soil begins to build up, these roots produce additional roots that become embedded in the soil. There are 15.9 million hectares (over 60,000 square miles) of mangrove forests in the warm waters of tropical oceans all over the world. Along the Atlantic coast they are found from Florida all the way down to Argentina. Mangroves grow on both the western and eastern coasts of Africa. They stretch into India, Burma, and south-east Asia. Mangrove forests are also common in New Zealand and Australia. For centuries mangrove areas have been used for timber, mining, agriculture, harbor development and human settlements. Mangrove areas were used for commercial shrimp farming during the late 70's and early 80's. However, using mangrove areas for shrimp farming proved to be unsustainable. Many governments have realized how necessary mangroves really are to the overall environment and have adopted mangrove restoration and conservation programs. 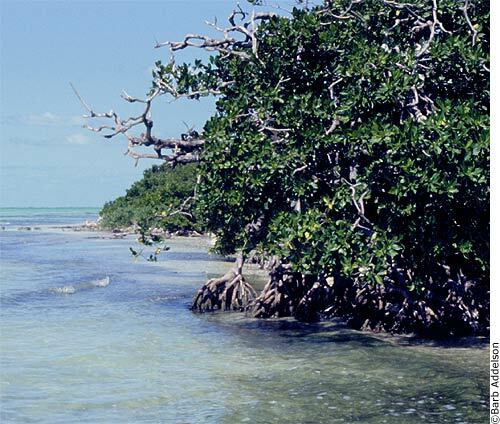 Strict legislation to protect mangroves is in place in many countries. Indonesia is home to over a quarter of the world's mangrove population. Coastal fish farmers on the Indonesian island of Java are given 45 hectares of land, but are required to plant mangroves on 20% of it. Seeds are gathered from budding sprouts and planted 6 to 9 feet apart. This sort of reforestation improves the environment, while feeding people and encouraging the economy. This is a sustainable long term solution.